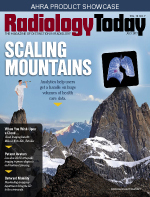 Mixed reality is making inroads in radiology. A new player in the industry, radiomics, is putting advanced imaging data in the hands of radiologists and other medical decision makers. 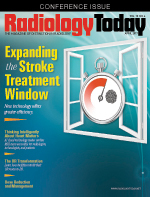 Cutting-edge efforts aimed at streamlining the synthesis of radiology and pathology are gaining ground. Cinematic 3D rendering is offering radiologists, students, and patients a vivid, high-tech, front-row view of internal human anatomy. Radiologist Emanuel Kanal, MD, FACR, FISMRM, unveils an app offering radiologists and technologists an unprecedented view of MRI procedures. GE Healthcare teams with the NBA on research for better player health. 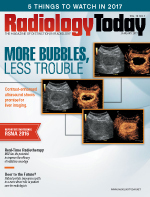 Effective pediatric radiography requires special considerations. Artificial intelligence tools help radiologists look for cancers in dense breasts by automating image processing. Experts weigh in on how to wisely use the extended time until the deadline for mandated implementation of clinical decision support software. Increased awareness of ergonomics improves radiology reading rooms and allows radiologists to do their jobs more comfortably and efficiently. Ultrasound and optical imaging can be used together to better detect atherosclerosis. New artificial intelligence algorithms in combination with coronary CT angiography are helping radiologists identify coronary artery disease risks. Optical imaging and ultrasound are being used to reduce the number of unnecessary biopsies and better treat women's cancers. Read about the latest research and findings presented at the 2017 SNMMI Annual Meeting in Denver. 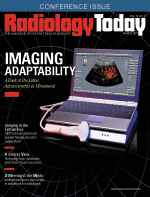 Organizations are increasingly seeking to coordinate imaging, positioning, and patient comfort. A documentary series helps shine a light on patients undergoing minimally invasive, image-guided procedures and the interventional radiologists who treat them. Spectral imaging and other advances offer new possibilities for CT as image quality, resolution, and improvements in workflow are becoming more important to customers. 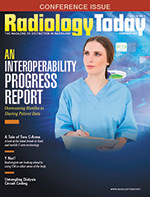 Clinical specialists and executives are developing and implementing enterprise imaging strategies to chart a course toward consolidated patient data. Data analytics are helping health care organizations harness their mountains of information as a way to meet future needs in the present. Thanks to cloud-based technology, children in the Make-A-Wish Foundation program are experiencing less radiation exposure and more streamlined care. Low-dose 2D/3D orthopedic imaging is improving safety, diagnosis, and treatment planning, especially in pediatric care. The rapidly expanding delivery of health care through freestanding emergency departments is giving consumers more options in how they receive radiology services, but consumers are encouraged to educate themselves before making a visit. 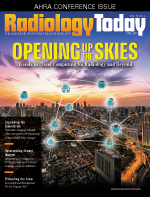 In this month's cover story, Radiology Today examines trends in cloud computing affecting radiologists and related multidisciplinary professionals. Synthesized 2D images bring a new view to breast imaging with less radiation. Early results have shown great promise for patient convenience and peace of mind. Volumetric MRI represents a step forward in technique and technology. The imaging software offers new options for measuring disease-related brain changes and is of particular interest in the diagnosis of Alzheimer's. We all know that patients have to be protected from unnecessary radiation exposure. 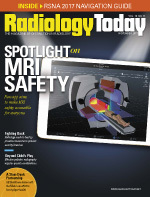 Here, we take a look at dose safety and management for your imaging staff. 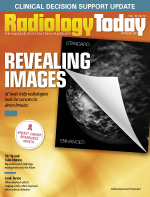 Despite advances in imaging technology over the last 100-plus years, radiology reports are still largely words only. 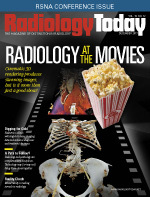 Should radiologists provide multimedia reports? Magnetic particle imaging offers an exciting new option for medical diagnostics and treatment. 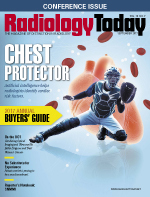 Read about the latest research findings presented at the 2017 Society of Interventional Radiology Annual Scientific Meeting in Washington, D.C.
Take a look at the latest trends in medical displays and monitors. AI cloud technology makes cardiac MRI more efficient for radiologists, technologists, and patients. What's the Score With CCS? What are the latest advancements in ultrasound? See what some of the major manufacturers have to say. Cone beam CT for extremity imaging is making inroads in outpatient orthopedic centers. 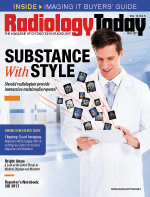 How will that affect radiology's domain? Despite all of the angst about artificial intelligence replacing radiologists, there may come a day when radiologists need AI to do their jobs. Breast density is attracting increased attention among mammographers, and many states already have notification laws on the books, but characterizing and quantifying dense breast tissue remains a subjective exercise. New tools offer the potential to examine the issue more clearly. The path to efficient patient data sharing is smoother, but there are still hurdles. The largest-ever revamp of its kind is set to end confusion and inconsistencies. Researchers are asking, "Why not?" regarding Y90 radioembolization outside the liver. Fixed and mobile C-arm usage is growing. Find out how health care facilities are choosing between them. Combining MRI with radiation therapy has the potential to target tumors more precisely. 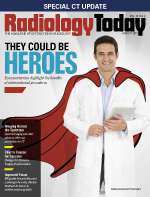 Patient portals may allow radiologists to demonstrate their value in new ways. There was plenty to see at RSNA 2016. Here are five things that caught our attention.